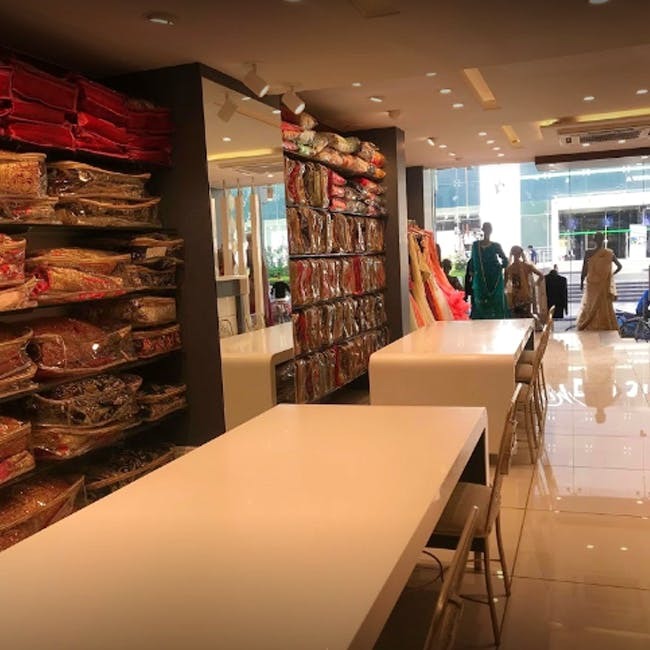 Over a hundred years old, Jauhar is a plush store, on Kamaraj Road, that is a dreamland for wedding wear, for brides, grooms and the squad. Spread across a couple of floors, Jauhar stands tall on Kamaraj Road (it’s located opposite Westside). Step into the store and you’ll immediately see sparkly lehengas in mint greens and blush pinks on display. These are perfect for your sangeet or that dazzling engagement of yours. Inside the store, you can take your pick from flowy, floor-length gowns and also anarkalis that come adorned with floral handwork. There are also caped gowns and those that come fashioned out of intricate lace. For your big day, they have heavily embellished lehengas in deep reds, serene pinks and maroons. You can also go for less traditional colours like forest greens and off-whites. The store has plenty for men too. You can choose from grand sherwanis and custom-made suits. They stitch some really sharp suits so do consider a bespoke design instead of simply picking from the rack. The prices are on the higher side but, hey, you (usually) only get married once right. Needs something custom made? Make sure you go well in advance since this is a popular store that gets plenty of orders. They’ll need a minimum of 15 days for a suit and around a month for a lehenga.